At a research seminar on April 8, Xie Fuzhan, newly appointed president of the Chinese Academy of Social Sciences (CASS) and secretary of the leading Party members’ group of CASS, talked with experts and scholars at the Academic Division of International Studies at CASS. Xie said that institutes under this division need to fully realize their own advantages, enhance their sense of responsibility and mission, grasp the new era and achieve new accomplishments, contributing to the great rejuvenation of the Chinese nation. Xie pointed out that since the 18th CPC National Congress, under the strong leadership of the CPC Central Committee with Comrade Xi Jinping as the core, socialism with Chinese characteristics has entered a new era, and China’s international influence and status have greatly increased, thus presenting new, higher requirements for the study of international issues. CASS must run the Academic Division of International Studies well, and the institutes under the division must have top talent and achievements, offer advice and suggestions for the development of the Party and the country, tell China stories well, facilitate Chinese academic research, develop Chinese theories, and disseminate Chinese ideas. 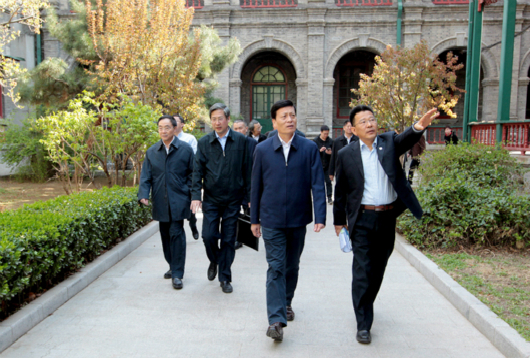 Xie put forward three requirements for the future development of the division. They need to study Xi Jinping Thought on Socialism with Chinese Characteristics for a New Era and the spirit of the 19th CPC National Congress as the primary political and theoretical tasks, and to keep the researchers’ thoughts and deeds in line with the decisions and plans of the CPC Central Committee, guiding the study of philosophy and the social sciences with basic Marxist positions, viewpoints and methods, and in particular, Xi Jinping Thought on Socialism with Chinese Characteristics for a New Era. Party committees in the institutes must strengthen leadership team building, consolidate efforts and unite, mobilizing the enthusiasm and creativity of all aspects, and inspiring researchers’ passion for research. In addition, it is necessary to strengthen the construction of the Party’s work style and clean government, strictly abide by the Party’s constitution and discipline, keep the bottom line, and grasp the fundamental and key points. Wang Jingqing, vice president and deputy secretary of the leading Party members’ group, presided over the seminar. Zhang Yingwei, member of the leading Party members’ group of CASS; Deng Zhonghua, head of the Discipline Inspection Group sent to CASS by the CPC Central Commission for Discipline Inspection and member of the leading Party members’ group, and Han Dachuan, deputy secretary-general of CASS, attended this. Prior to the seminar, Xie and others visited the library of the Institute of Russian, Eastern European and Central Asian Studies and the exhibition of the achievements of the National Institute for Global Strategy at CASS.